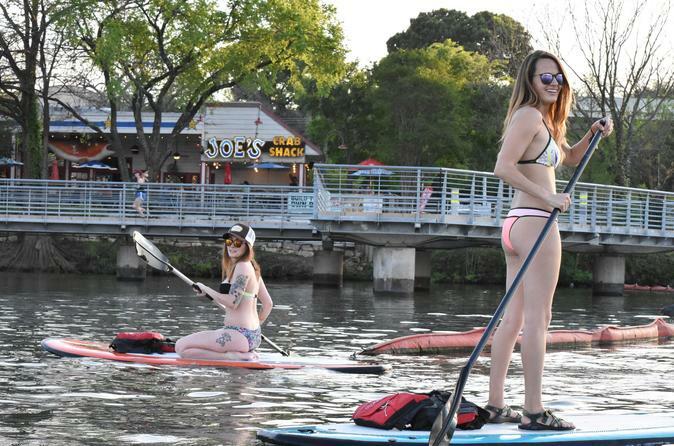 We offer a wonderful thirty minute paddle board lesson with an experienced guide and then let you enjoy a hour and half on Lady Bird Lake to practice at your own pace. Paddle board training is the first step to surfing. This small group tour includes all equipment needed for the adventure. After a lesson with your local guide, you will have the confidence to explore the beautiful surroundings of Lady Bird Lake, also know as Town Lake. As you paddle around, your guide will give you tips on how to improve your technique as well as educate you about the history of the city of Austin. Many different types of wildlife exist in this eco-urban habitat. Your guide will help spot and explain what you are seeing and searching for. -Paddle boarding experience is helpful but not necessary as we will teach you everything you’ll need to know. -Our instructors are certified to keep you safe on your tour.